Yellow fever was the scourge of the 19th Century on the Gulf Coast. It was also known as the "saffron scourge", "bronze john", black vomit", and "yellow jack". Ships traveling from the Caribbean region to New Orleans and Mobile often brought the larvae of the Aedes aegypti mosquito in their water barrels. The yellow fever virus, marked by jaundice, high fever, nausea, internal hemorrhaging, and often death, was carried by this tropical insect. The worst yellow fever epidemic on record occurred in 1853. New Orleans was particularly hit hard that year, as 10,000 of the 30,000 persons infected with the virus died. It earned the Crescent City the epithet "Necropolis of the South". Two other years of pandemic proportions in the Gulf Coast were 1858 and 1878. The small towns and villages of coastal Mississippi were a popular retreat for those who could afford to leave New Orleans during the "sickly season". This period coincided with the time of greatest fever danger which commenced with the beginning of warm weather in late May to early November, or the first killing frost. Naturally, Ocean Springs was a favorite place to escape the heat, humidity, and general malaise of the Big Easy. The 1878 Epidemic started at New Orleans in July and took nearly four months to run its course through the Mississippi and Ohio River Valleys. When it was over, the nation recorded more than 100,000 cases of fever and a mortality estimated as high as 20,000 people. Particularly hard hit were the cities of Memphis (approximately 6,000 deaths), New Orleans (between 4,000 and 5,000 deaths), and Vicksburg where about 1,000 victims fell to the pestilence. Fever cases and deaths occurred as far north as St. Louis on the Mississippi River and Louisville, Kentucky and Gallipolis, Ohio on the Ohio River. The economic impact to the nation was over $100,000,000 due to the suspension of industry and trade, lost wages, medical attendance, and relief for the thousands of sick and unemployed. It is estimated that New Orleans lost $15,000,000 during the crisis. By late September 1878, health conditions in Mississippi had gotten so grave that Governor John M. Stone made a proclamation. Part of which read as follows: "I, J.M. Stone, governor of the State of Mississippi, do recommend that on Friday, the 30th day of September, all Christian people throughout the State repair to their respective places of worship and offer up their united petition in prayer to God, that He will withdraw from our people this terrible affliction, and that He, in His infinite goodness and mercy, will restore them to health and bring peace to their mourning households". Since the yellow fever quarantine had shut off the people of Ocean Springs from the outside world, conditions were very difficult. The Ocean Springs Relief Society was formed in early September 1878, to assist those in need. H.H. Minor Sr. (1837-1884) was president, R.A. Van Cleave (1840-1908)-treasurer, and J.M. Ames, secretary. The society collected $767.25 with the Howard Association of New Orleans, the citizens of Galveston, Texas, and the Moss Point Relief Committee being the largest contributors. The L&N creosote plant at West Pascagoula (Gautier) sent ten barrels of creosote free of charge to be distributed among the populace. It is believed the creosote was burned to "purify the air". Several letters referring to the 1878 yellow fever epidemic survive and shed some light on this perilous event at Ocean Springs. Dr. Don Carlos Case (1819-1886), a native of Albany, New York, practiced medicine at Ocean Springs from sometimes after the Civil War until his demise in 1886. In 1881, the Case family built a large neoColonial style home on the southwest corner of Washington and Porter. The Case heirs sold it to H.F. Russell (1858-1940) in 1905. The Russell home was damaged in February 1933 conflagration and later removed. It has been a matter of much interest with some, and great solicitude with many, to know the true and exact situation as to the health and sanitary conditions of this Gulf Coast. I have seen in your paper communications from Bay St. Louis, Mississippi City, and Biloxi giving assurances of the good health and entire exemption from yellow fever of those places, and I deem it my duty to make known the true situation at this place. We have had one death from yellow fever at this place, that of Colonel Strout of the Hotel (refers to the Ocean Springs Hotel). He was my patient from the first and I was with him to the death. He died on the third day of black vomit. He was a Northern man, only two and a half years in the South; never had any acclimating sickness, and was otherwise a highly susceptible subject, laboring as he did under organic disease of the kidneys. Being the principal outside manager of the Hotel, he was unavoidably and constantly brought in contact with persons, goods an mail matter arriving daily from the city (New Orleans). Only one other case, a lady guest at the Hotel, has had fever, but she has fully recovered. This lady was taken with the fever simultaneously with Colonel Strout, and consequently must have contracted the disease in a similar way. Not another case has occurred up to this time, and no symptoms of any, neither at the Hotel nor in any part of town. Mrs. Huntington, the lady matron of the Hotel, and her young and amiable daughter, but recently from the North and wholly unacclimated, were the principle ones to nurse and take care of Colonel Strout during his sickness and death; yet neither of them contracted the disease. I mention this circumstance more particularly to show how little or likely the disease is spread in the pure and invigorating atmosphere of the Gulf Coast. The Hotel has been thoroughly fumigated and cleaned, and is now in as healthy condition, and as free from all contaminating influences as it ever was. The town is in a most perfect sanitary condition. No sickness nor no cause of sickness. No fears are entertained of any spread of the fever at this place and we extend to our friends in the city (refers to New Orleans) acordial greeting, that they may come here with perfect safety, and enjoy the pure wholesome atmosphere of this Gulf Coast, and thereby escape the foul and pestilent atmospheric conditions of the city. Very truly yours, D.C. Case, M.D. Additional research on this subject has uncovered some interesting side lights to this letter of Dr. Case. A series of approximately forty letters written from August 2, 1878 until September 15, 1878, from Mary Plummer Buford (1808-1878) at Ocean Springs to her husband Albert G. Buford (1813-1878+) of Water Valley, Yalobusha County, Mississippi, relate some of the events of the 1878 Yellow Fever Epidemic. The Buford letters are now in the possession of Wally Northway, a descendant of A.G. Buford. Northway is a resident of Florence, Mississippi. "no railroad train, car or engine shall, after the 29th day of July (1878), stop within the limits of Jackson County when coming from said city of New Orleans, under penalty of law, but shall be allowed to travel at a rate of speed not less than ten miles an hour when delivering mails, and all vessels coming from New Orleans shall wait the quarantine physician outside of the bar at the mouth of the Pascagoula River. 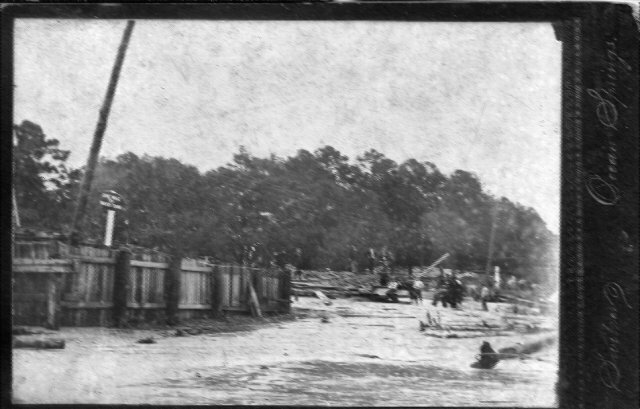 When coming into Ocean Springs one shall stop at he county line, one mile below the railroad bridge, about opposite the old Egan wharf, and shall then be subject to the orders of the quarantine physician at the respective places, and no person shall come into the county of Jackson who has been in the city of New Orleans within the last ten days pending their arrival in said county". Mrs. Buford was attempting to ascertain the condition of her property in the Gulf Hills area known then as the Oak Lawn Place. She stayed at the home of Mrs. Tobias on Washington Avenue opposite the Shanahan House. While on this mission, she contracted the dreaded "yellow jack" and died at Ocean Springs on September 11, 1878. Before her demise, Mrs. Buford also recorded the death of Colonel Strout of the Ocean Springs Hotel. On August 19, 1878, she wrote to her husband at Water Valley: Mr. Strout one of the proprietors of the hotel died last night, and Dr. Dunlop (sic) dispatched the board of health this morning...that he died of black vomit and the place is in ferment. The citizens have protested against his remains being carried through town and he will be buried in the hotel yard. I am quite well and trust in God that I may escape the dreaded fever that is growing fast upon us. There is another case at Shanahan's were the priest (Father Charles Van Quekelberge) is sick. Miss Huntington died this morning. Mrs. Huntington was taken down last night and her son is very low. I doubt not that the fever will attack all here who are unacclimated. It has a long time to run yet. I am hopeful as to my acclimation which is in a fair way to be tested. Mrs. Tobias and Mary Perin visit the sick at Shanahan's, and the priest is very ill and Mary says he is very yellow, so I am then liable to take it at any time, if not acclimated. I have used disinfectants the best I could, but time will show. The Pascagoula Democrat-Star reported in September 1878, that John and Mrs. Huntington were ill at the hotel of yellow fever. Her eighteen-year old daughter, Alice Huntington, a native of Cleveland, Ohio died of the fever on September 2, 1878. Mrs. Huntington and her son, John, must have survived the fever as they were reported leaving for Ohio in early November 1879. Other known to be ill in the village were: Three from the Maginnis family; Mr. Blackburn; Mrs. Johnson; Mrs. Julia Egan (1833-1907) and her two sons; Dr. J.J. Harry (1854-1950), two daughters of Mrs. Shanahan, and Miss Ida Delavallade (1862-1878+), the granddaughter of Belle Tiffin (1824-1900) of New Orleans. Dr. Jason J. Harry, a native of Hale County, Alabama, had just received his medical degree from Tulane when he came to Ocean Springs. Dr. Harry was in charge of the yellow fever quarantine here. The local reporter for the Pascagoula Democrat-Star related on October 4th that, "Dr. Harry is still true and heroic in the cause, and his efforts have been crowned with success, as almost alone he stands. Being young and unacclimated we fear he will fail". Dr. Harry recovered and moved to Handsboro where he replaced Dr. John Lyon who expired of the yellow fever. Colonel F.S. Strout (?-1878)-manager of the Ocean Springs Hotel and a Northerner. Died August 18, 1878. Buried in the Ocean Springs Hotel Cemetery. Alice Huntington (1860-1878)-daughter of James and Matilda T. Huntington of Cleveland, Ohio. She died on September 2, 1878. Miss Huntington was a member of the Methodist Sunday School and one of the brightest pupils in the bible class. She was probably buried at the Ocean Springs Hotel Cemetery. Miss Matthewson (d. 1878)-no information probably died September 2, 1878. Mary Helen O'Keefe (1863-1878)-daughter of Edward O'Keefe (1815-1874) and Mary Tracy (1832-1895). She died on September 5, 1878. Miss O'Keefe is probably buried at the Evergreen Cemetery. Mrs. R.A. Thomas (1815-1878)-wife of B. Thomas. She may not have been a victim of the fever, but did die on September 7, 1878. No further information. Father Charles Louis Van Quekelberge (1835-1878)-pastor of the Catholic Church at Pascagoula and a native of Ecloo, Belgium. He died on September 10, 1878, and his remains were interred at the Evergreen Cemetery. In 1869, Father Van Quekelberge advised Bishop Elder to build a new church at Ocean Springs. This resulted in the church relocating from Porter to a new structure on Jackson Avenue in February 1874. It is believed that Van Quekelberge came to Ocean Springs from Pascagoula to assist Father Meerschaert in comforting the ill and assisting at burials until he was striken with the fever. He died at the home of Irish immigrant carpenter, John J. Shanahan (1810-1892). The Shanahan home was located on the northwest corner of Washington and Calhoun. Joseph Ryan (1840-1878)-son of Jerome Ryan (1793-1870+) and Marie Euphrosine LaFontaine (1802-circa 1846). Ryan expired on September 15, 1878. His remains were probably buried at the Bellande Cemetery. Mrs. Denison (d. 1878)-no information. Died September 21, 1878. Mr. Kimbrough-(d. 1878)-no information. Died September 1878. Two children of W.S. Brown-no information. Died September 1878. Two and possibly three children of Mrs. James (a visitor)-no information. Died October 1878. Charles W. Eason (1849-1878)-a native of Westfield, New York died on October 12, 1878. Probably the last victim of the 1878 Epidemic at Ocean Springs. A journalist reporting from Ocean Springs for The Pascagoula Democrat-Star on October 28, 1878, had this to say about the 1878 Yellow Fever Epidemic: "when poets write and journalist tell the sad tale of 1878, upon the page in black and white Ocean Springs will be seen, but to heaven cast an eye, 'Amen', not the first neither the last in the mention of epidemics. When to the graveyard on our annual procession let someone plant a flower and breathe a prayer over the newly made graves of the strangers that with us met the dark lot fate had in store for us". The 1897 Yellow Fever Epidemic started at Ocean Springs in August. It was initially believed that the more than five hundred cases at Ocean Springs were dengue fever and that it had originated at Ship Island. Dr. Olliphant, president of the Louisiana Board of Health, in his official report declared the contagion as a mild type of dengue fever. His declaration was later reinforced by Colonel R.A. VanCleave (1840-1908) who was quoted by The Pascagoula Democrat-Star on September 17, 1897, as follows: I have been through the yellow fever epidemics of 1875 and 1878 and according to my experience and observation, no yellow fever exists or has exited in Ocean Springs. Later in September, yellow fever was diagnosed and New Orleans and the rest of the South quarantined Ocean Springs. Unfortunately hundreds of excursionist had already returned to New Orleans and the pestilence soon spread to cities in Alabama, Louisiana, Mississippi, Florida, Tennessee, Texas, and Kentucky. The final records for the 1897 episode indicate that nearly 500 deaths occurred from the 4000 cases of fever reported. New Orleans accounted for 300 deaths. 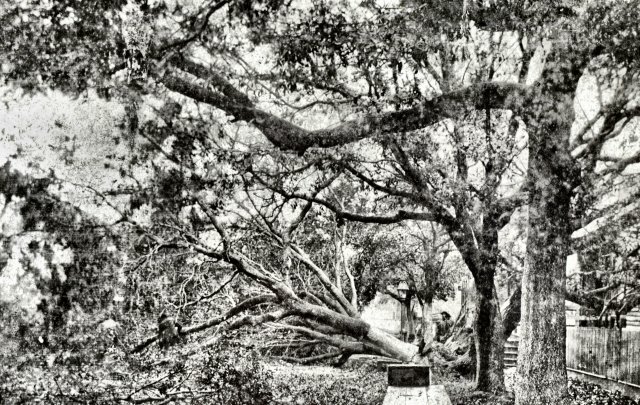 At Ocean Springs, it is believed that three people died from yellow fever. Dr. J.H. Bemiss (1855-1897) of New Orleans who came from New Orleans to assist the over worked Ocean Springs medicine men died from the black vomit. It is interesting to note that Dr. O.L. Bailey (1870-1938), who was in the thick of the epidemic at Ocean Springs, had a son born on June 29, 1898. He was christened Bemiss O. Bailey. The other fever deaths are believed to have been a Miss P.E. Schultze and a Mr. William Seymour, Jr.
On November 19, 1897, The Pascagoula Democrat-Star in a summary of the deaths that occurred during the crisis at Ocean Springs reported the following who died during this period: August 1897-William Siegerson, Mrs. Saunders, Mary Murphy (1807-1897), Susan A. Berry (1848-1897), Fearn Egan, Lula Alfriend, T.A.E. Holcomb (1831-1897), and Jennie Dillon. September 1897- Dr. J.H. Bemiss (1855-1897), John T. Tillman, Sarah Johnson (Black), P.E. Schultze, William Seymour Jr., W.S. Bransford, O.W. Elan, Mattie Goodrich, and Mrs. Ida L. Cubbage (1870-1897). Captain Antoine V. Bellande (1829-1918) was appointed the official fumigator. Men under his supervision disinfected and fumigated places where deaths had occurred. Bellande worked as a bar pilot at Ship Island and had been exposed to yellow fever and quarantines there for decades. It was never ascertained with a high degree of certitude the source of the initial yellow fever case at Ocean Springs. It was initially thought that a traveler from Guatemala was the culprit, but later opinion established the probability that the scourge was brought here by Cuban rebels who operated out of Ocean Springs at this time. At Jackson County, two facilities were established for quarantine purposes. A detention camp, called "Camp Fountainbleau", was built nine miles east of Ocean Springs, and the Round Island Quarantine Station off Pascagoula was designated a place to receive refugees arriving from infected places. "Camp Fontainebleau" was established by the United States Marine Hospital Service transferring from Waynesville, Georgia. Soldiers guarded the six hundred refugees in the camp which had two areas-one for treating yellow fever cases lead by Dr. Gaines and the other for those suspected of having the disease which was in charge of Dr. Giddings. Although never used again, a "Camp Fontainebleau" remained until the last lumber was sold in 1916. The buildings were sold and the equipment was shipped to other camps as needed. A.V. Sceals (1859-1916), the custodian, who transferred from Georgia, kept this position until all of the medical equipment was removed. Sceals, a native of Edgefield, South Carolina, was a building contractor and later construction foreman for the L. & W. R.R. He formerly lived at Brunswick and Atkinson, Georgia before he entered the U.S. Marine Hospital Service at Waynesville, Georgia. Children: Robert W. Sceals, James Edwards Sceals, Mrs. J.M. King, Mrs. W.T. Lacy, and Avis Beulah S. Walker (1898-1946). Khaled J. Bloom, The Mississippi Valley's Great Yellow Fever Epidemic of 1878, (LSU Press: Baton Rouge, Louisiana-1993), pp. 280-281. Margaret Humphreys, Yellow Fever and the South, (Rutgers University Press: New Brunswick, New Jersey-1992), pp. 136-137. John W. Scott, Journal of Mississippi History, "Yellow Fever Strikes Bay St. Louis: The Epidemic of 1897", Vol. LXIII, No. 2, Summer2001. Source Material for Mississippi History, Jackson County, WPA Historical Project-1939, pp. 419-420. Mississippi Coast History and Genealogical Society, Volume 9, No. 4, "A Short History of Saint Alphonsus Parish, Ocean Springs",November 1973, pp. 132-133. The Daily Herald, "The Mississippi Coast and Yellow Fever", March 1, 1936. The Ocean Springs News, "Body of A.V. Sceals Found---No Foul play. Death by Nat'l Causes", February 10, 1916, p. 1. The Ocean Springs News, "A.V. Sceals Obit", February 17, 1916, p. 4. The Pascagoula Democrat-Star, "Ocean Springs Items", August 23, 1878, p. 3. The Pascagoula Democrat-Star, "Died-Alice Huntington", September 13, 1878, p. 2. The Pascagoula Democrat-Star, "Governor Stones Proclamation", September 20, 1878, p. 2. The Pascagoula Democrat-Star, "In Memoriam-Mrs. R.A. Thomas and Mary Helen Keith", September 20, 1878, p. 2. The Pascagoula Democrat-Star, "From Ocean Springs", September 27, 1878, p. 3. The Pascagoula Democrat-Star, "Ocean Springs", October 4, 1878, p. 2. The Pascagoula Democrat-Star, "Ocean Springs", October 18, 1878, p. 2. The Pascagoula Democrat-Star, "Died-C.W. Eason", October 18, 1878, p. 2. The Pascagoula Democrat-Star, "Ocean Springs", October 28, 1878, p. 2. The Pascagoula Democrat-Star, "Report of the Ocean Springs Relief Society", December 20, 1878, p. 2. The Sea Coast Echo, September 11, 1897. On the humid morning of July 6, 1916, railroad agent, John Drysdale (1869-1934), walked slowly across the L&N Railroad Bridge from Ocean Springs towards Biloxi. Soon he would announce to the world the fate of his little town on the eastern shore of the Bay of Biloxi. During the early morning hours a hurricane struck the Mississippi Coast roaring through Ocean Springs with wind gusts up to 125 mph. Destruction wrought by the tempest was manifested in roof, fence, chimney, tree, and shed damage. No one was seriously injured, but plumber, George Dale (1872-1953), got a good scare when the Knights of Pythias Hall, which he was occupying during the storm got blown off its foundation. 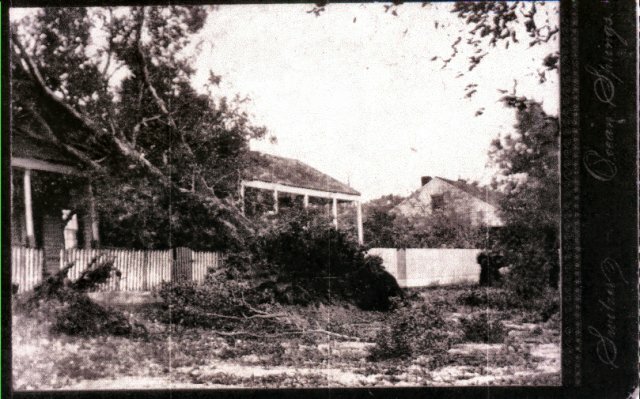 The colored Baptist Church was heavily hit by the strong wind force, and had to be torn down in the days following the storm. In the country, the Rose Farm north of Fort Bayou reported severe damage. At the C.E. Pabst (1851-1920) pecan orchards some of the older trees were damaged. More fortunate was Theo Bechtel (1863-1931) reporting only slight ruin to his potential crop. At Biloxi, L&N agent Drysdale found that city in great suffering. The hurricane had struck there also with unrelenting fury. The Back Bay and Point Cadet areas were especially hit hard. It would be days and even weeks before all the news of the great natural disaster would be known. At the time many ships were operating in the Mississippi Sound. These vessels weren't outfitted with the communication and weather reporting devices we have today. Consequently, most of the sailors and their vessels were caught unprepared. Many of the Biloxi schooners were fortunate in that they were working near the partially sheltered Louisiana marshes. Other mariners sought haven in the lee of the offshore barrier islands. Those not so fortunate rode the storm out at sea. Most seamen made it home to their port. One small Biloxi schooner wasn't so fortunate. It was the Emma Harvey and her story follows. The Emma Harvey participated in some of the early Biloxi schooner races. In the 1901 Biloxi Regatta, she withdrew before finishing the first round because of heavy seas. After the days of the White Winged Queens had passed, the Emma Harvey was converted to a charter boat and trawler. She was last seen about 1978 in a canal at Cedar Point, Alabama north of Dauphin Island. Every ship has a tale to tell. TheEmma Harvey has many and is an unusual craft as will be demonstrated. A vivid description of the harrowing experience in the Chandeleurs aboard the Beulah D is given by Louis Largilliere (1861-1950) inThe Daily Herald on the 10th of July, 1916, pp. 1 and 3. He stated: that he never wanted to go through such an experience again and he is grateful that he reached the mainland again. The Beulah D was caught in the storm while at anchor in Chandeleur Sound near North Keys. After the blow had overtaken them they put out two anchors but they were of no avail and the schooner was carried about the Gulf for a distance of thirty five miles after the masts had both blown out by the gale. During the drifting of the boat the members aboard were compelled to remain below most of the time as the wind was so strong that had they attempted to walk on deck they would have been blown overboard and lost forever. The hatches of the boat were blown away and canvas had to be tacked down to keep out the torrents of rain. By late July, the hunt for the missing schooner continued aboard the Ursula C now captaincy by Flood Lanius. Henry and Fred Duggan, son of Captain George Duggan, were also aboard. The search party now concentrated its relentless efforts to the east combing Horn, Petit Bois, Dauphin, and lesser islands in that area. They also went to Pascagoula, Mobile, and the west Florida coast seeking information and leads. There were some sightings in the eastern Gulf, which gave hope for locating the missing crew and boat. The Coast Guard cutter,Tallapoosa, reported on July 11 that it had passed a schooner's mast twelve feet out of the water at Latitude 29.18 N and Longitude 86.55 W (approximately 100 miles southeast of Pensacola). About the same time, the private yacht, Shirin, of New Orleans passed a vessel within six miles of Grant's Pass (near Dauphin Island) with its right side up. A trip by the author, to Cedar Point and Dauphin Island, Alabama on December 31, 1990 resulted in telephone conservations with Sadie Mae Collier Serra and John Henry Lamey. Sadie Serra is the daughter of Frank Collier. According to her, Frank Collier obtained the Emma Harvey from a Bon Secour man in a trade. The man may have been John Steiner or Budgey Plash. Collier gave $800 worth of fine oysters for the vessel. slowly grew, and the Collier children were integrated into the operation as their age allowed. Sadie Mae Serra said that the Collier fortunes improved rapidly after the Emma Harvey acquisition. Initially, the old Biloxi schooner was put to work as a ferryboat transporting people, mail, automobiles, and cattle from Cedar Point to the island. The Colliers ran a herd on the west end of Dauphin Island. Prior to World War II, the Emma Harvey would take day charters to the snapper banks. During the war years, fear of German submarines caused Captain Collier to ply the coastal and bay waters for trout. He would take as many as twenty people out for $30 per day and give them a delicious fish fry after the trip. the night of fierce winds and violent seas, the vessel had stood as a barrier to protect the Colliers' building from storm tossed flotsam and other debris. Today I receive a telephone call from Bobbie Bond Helm who resides at 309 Live Oak, Ocean Springs, Mississippi. She tells me that her husband, Joseph O. Helm, Jr., is the nephew of John Henry Helm (1893-1916) who was a crew member of the Emma Harvey. Mrs. Helm further details the Helm Family relating that there were four Helm brothers and a sister: Conrad (1890-1914), Martin Helm (1891-1954), John Henry (1893-1916), Joseph O. Helm (1896-1968), and Rita Helm (b. 1898). Their father, John G. Helm (1867-1949), of German ancestry was born at New Orleans while their mother was Josephine Molero (1858-1914) of St. Bernard, Parish. The Moleros were from the Canary Islands. All the Helm men were born at New Orleans, and died at Biloxi, except John who was lost at sea east of the Chandeleurs on July 5, 1916. To my present knowledge, other Ocean Springs residents with familial connections to the Emma Harvey through its builder, Casmir J. Harvey (1845-1904), are: former Ward IV alderman, Phil Harvey; Carroll Clifford, Jackson County Board of Supervisor from Gautier; and myself. Phil Harvey is as direct descendant of Pierre Harvey, Jr. (1841-1878) and Victoria Koehl (1850-1904). Clifford descends from the builder, Casmir Harvey and Rosina Husley (1852-1937), and I am a descendant of Marie Harvey (1840-1894), and Antoine Victor Bellande (1829-1918). Marie was the eldest child, of French immigrant, Pierre Harvey (probably Hervais or Herve) (1810-1880+), and Celestine Moran (1811-1883). Casmir, Pierre, Jr., and Marie Harvey, who were born at Back Bay (present day D'Iberville), were siblings.